We love using Grammarly for checking the grammar of our blog posts and emails. We highly recommend the free version, but Grammarly Premium version offers a lot of additional features that aren’t available in the free version. 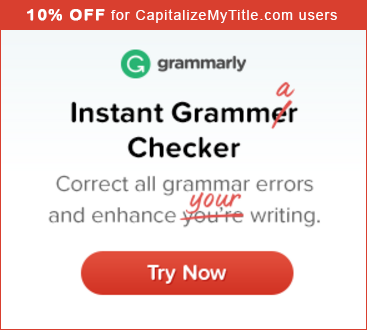 While it can be a little bit pricey, we’ve negotiated a special Grammarly discount for CapitalizeMyTitle.com users. Clicking on the banner below will get you 10% percent off of Grammarly Premium. If you want to learn more about Grammarly before you buy, read our Grammarly review. Previous articleIs Presidents’ Day Capitalized?